In sniper school, snipers are taught in the areas of camouflage, stalking, and precision shooting. The trained sniper has many ways of utilizing camouflage. One of the main ways is by using a ghillie suit. A sniper ghillie suit is a set of clothes that have been specially modified, using strips of canvas, to look like a pile of underbrush. Snipers wear these suits while on the stalk. It takes more than a suit to conceal the sniper. He also used face paint. The most important part of a snipers camouflage is subtlety. By moving very slowly and paying attention to his surroundings, a sniper can be invisible in the open in plain sight. For instance, he might hide in a field of wheat, which provides natural cover. Precision shooting is one of the qualities that one may think of synonymously with snipers. A sniper trainee will spend hours on the shooting range and use thousands of rounds in his training. The trainees must reach a certain level of consistency in order to become full fledged snipers. 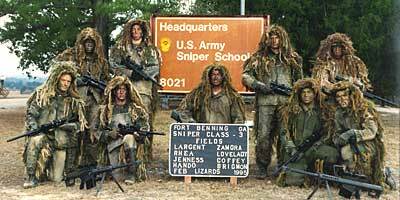 There are several branches of the United States military that offer training for sniper scouts. Of these,The United States Marine Corps Sniper Scout School is widely accepted as the best. At present, U.S. military sniper schools are booked up, and have an eighteen month waiting period. There are also private organizations that offer sniper training. A few of these include Blackwater, which is a private security firm that claims to have the most comprehensive military, police and peace keeping force in the world, and the Macmillan sniper school.